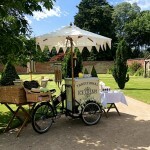 If you are looking for something extra special and you want to impress your guests then our vintage 1940’s ice cream tricycle will add a wow factor to your wedding, party or event. With our all inclusive ice cream bike hire prices and packages there are no hidden extras. We will work with you to find the right package that suits your requirements and budget. All bookings are secured with a £60 non-refundable deposit with the remaining balance being paid 30 days prior to the event. Bookings cancelled 28 days before the hire date incur 50% of the full hire charge. Bookings cancelled within one week incur 75% of the full hire charge, we will always endeavour to accommodate clients on an alternative date but this cannot be guaranteed. The Ice Cream Dream will serve your chosen flavours of ice creams/ sorbets to you and your guests at your selected venue on the date and time as agreed in advance. Chosen ice cream/ sorbet flavours are subject to availability. Should any variety of ice cream/ sorbet be unavailable a suitable replacement will be chosen. Please ensure that you check with your venue that the access is suitable and that we are able to attend. We require an 8 x 5ft serving area with a little extra space for our side table. Doorways should be at least 3ft 6inches wide to allow access. If there are any steps (as few as possible please) then we will need to know in advance. Please ensure that there is a parking space for our vehicle and trailer. When booking with us, you are booking the agreed number of guests/package, date and service time. We will normally arrive 1 hour before service time to liaise with a member of staff and set the tricycle up. There may be an additional travel cost for events over the distance of 10 miles from our base in Conwy (you will be made aware of this upon booking). In the unlikely event due to unforeseen circumstances that we are unable to reach your venue by the agreed time, we will contact you en-route and your service will commence once we have arrived and set up.